I live to watch golfers play beyond a level they ever thought was possible. I live to make it look easy to unlock a golf game that you can enjoy for life without the hassles of frustrating golf instruction that makes you wonder just why you play golf in the first place. I believed it was possible to play golf well without focusing on your golf swing. That belief led to the discovery of the secrets of consistency and the Zone. In spite of a painful back injury, my love of golf made me persevere to find answers. At first, I just wanted to be able to play a full round without having to quit from severe pain, but when I showed others how I was able to play, they started asking for more. I enjoy seeing struggling golfers break through. I relish the smiles when they realize that more distance doesn’t require swinging hard and that accuracy is a matter of properly channeled awareness. I didn’t learn golf at a country club. I started with some used clubs, read everything in print, and watched every video I could get my hands on looking for answers. 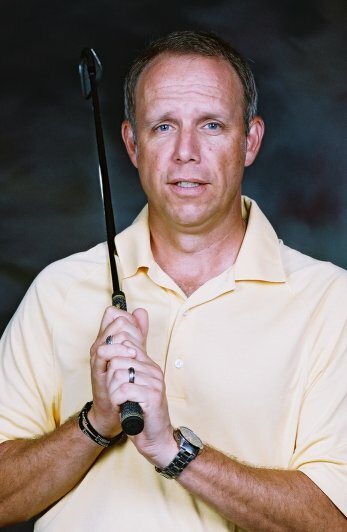 It wasn’t until I finally gave up that I stumbled on the path that finally led me to be blessed to have helped over 15000 golfers world-wide to overcome their struggle with golf. What I’m saying is simply that I’m not some instructor making something up to make a buck. Fate brought me here and dropped this in my lap, knowing I wouldn’t turn my back on the golfers. If you work with me on your golf game, don’t expect a traditional approach to the game. DO expect fast results. Take some time to read the free articles. Then work on the first three lessons. Follow directions to the letter and email me with your results after each lesson. I’m sure that with an open mind, Bio-Visual Focus will alter your ideas about golf and help you to believe that golf actually IS an easy game. I always like to hear ideas from golfers, so comments are welcome. Hi Tracy, this is all very interesting for me and have only discovered it for an hour or so and have not even started the first lessons. However I really must ask you something that has now bugged me for 5-6 years and although alot of improvement still not have been able to grasp it, I hope you can help. As I say around 5-6 years ago I noticed that when I looked back into a mirror and swung from there I had what i felt and still feel and what alot of pros and good golfers have told me is a great golf swing. However when my head goes back down I never seem to get the same feeling. I can actually hit the ball really well loking back and then at the ball just before impact but that will never be good enough for the standard i want to play at. I am currently a 9 handicap and was in my yourger years even down to 1. When are you going to publish your new book??? Still editing… It’s a tiring process but I believe it is worth it. is there a new book?